On 1 February 1968, two Memphis garbage collectors, Echol Cole and Robert Walker, were crushed to death by a malfunctioning truck. Eleven days later, frustrated by the city’s response to the latest event in a long pattern of neglect and abuse of its black employees, 1,300 black men from the Memphis Department of Public Works went on strike….. This is the social landscape on which Memphis, Martin, and the Mountaintop: THE SANITATION STRIKE OF 1968 was set. Memphis, Martin and the Mountaintop is a historical fiction book based historical facts and the memories of Lorraine Jackson, who was a child at the time of the strike. The book is a combination of prose and poetry which gave raw emotion to this confessional style story. I’m over the moon to be able to share this book with my readers in time for Multicultural Children’s Book Day! 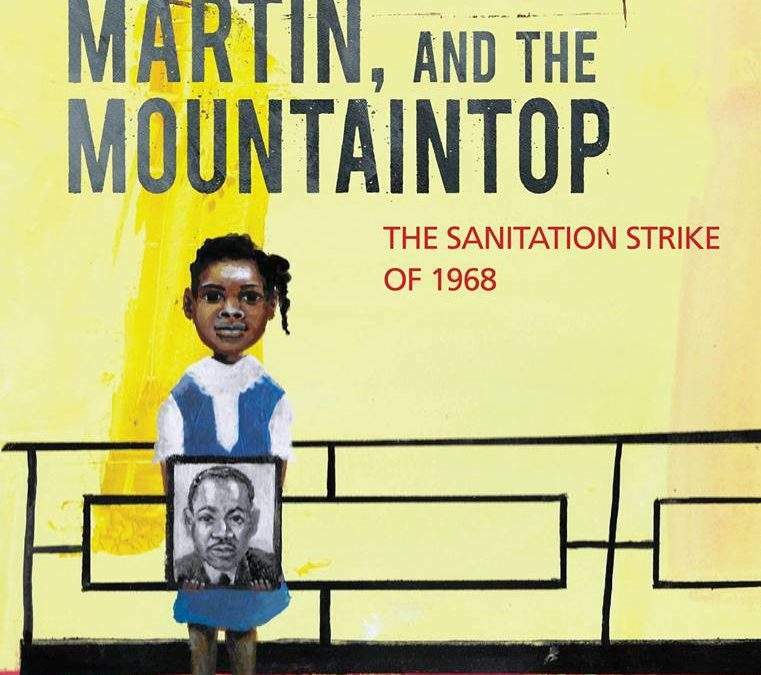 Memphis, Martin, and the Mountaintop: THE SANITATION STRIKE OF 1968 is engaging, informative body for work that should be an essential read for everyone. Memphis, Martin, and the Mountaintop at the start reminded me of Act 1 of Fences, the play, by August Wilson. Perhaps it was palpable mixture of anger, frustration and fear. Like Mr Jackson, Troy Maxson (in Fences) was a sanitation worker. However, Fences ends in 1965 Philadelphia and Memphis events began in 1968. The book is geared towards 8 -12 years old. It’s delivered an honest, age appropriate recount of events which led up to the strike to the end of it. Like anybody, I would like to live a long life. Longevity has its place. But I’m not concerned about that now. I just want to do God’s will. And He’s allowed me to go up to the mountain. And I’ve looked over. And I’ve seen the Promised Land. A modern day Moses, Dr. King Jr., he’d led his people to the border of the Promised Land but he was unable to go further. Dr. King Jr. was assassinated on 4th April, 1968. Each word in Memphis, Martin, and the Mountaintop is precious. Lorraine’s voice is at first curious and concerned as a child develops to what I think was her mature self; she looked back upon the events. She tells us ‘Freedom is never free.’ The illustrations perfectly complement the book. It draws us in to the private spaces, peer at the faces and feel the emotions of Lorraine, her family and the nation. I thoroughly enjoyed it. It made me fall in love deeper in love with the power of words. History continuously shows us that one man can make a difference but if we join together, we cannot be beat. For more information on Alice Faye Duncan’s books visit her website. 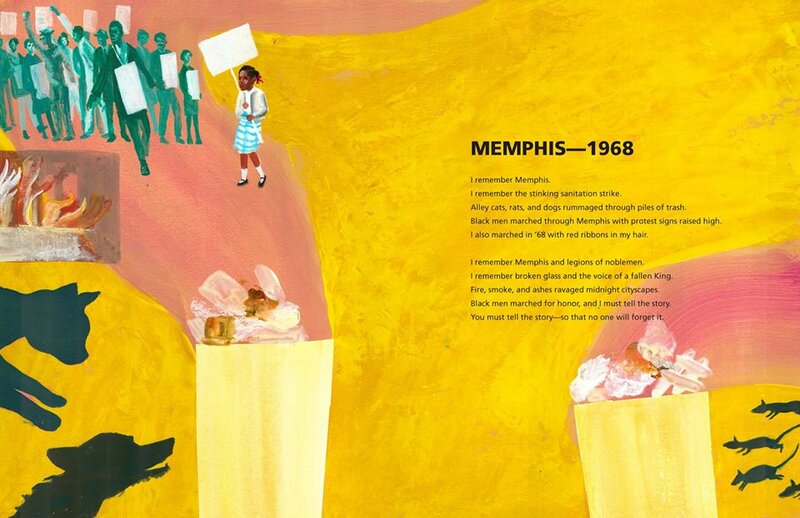 Additionally, teachers can access free lesson plans and a PowerPoint to use with their students on Memphis, Martin, and the Mountaintop: THE SANITATION STRIKE OF 1968, from her website.